When I'm guiding tours in Jaffa and Tel Aviv I usually tell the participants that the best thing I can do to further their understanding of what is going on in this region, is by complicating issues. Rather than providing them with a logical or linear version of history, my aim is to reveal the intricacies of the history of this place by blurring categories of good versus evil, of victim versus perpetrator, of Arab versus Jew, and by emphasising the variety of complicities of the different actors involved in the long history of this region. Last week I was guiding a tour that added to the shaking of my own categories and brought me back to reflect on my own position in and vis-a-vis this country. A few days before the tour, I was told that my only participant had "special requests" and that I should probably do some research in order to meet his needs. The participant's family name sounded quite familiar: Dajani. I recalled an event around a year ago, when a square in Jaffa was named after a Dr. Fouad Dajani, who had been the founder of the first private hospital in Palestine and I remembered discussing this ambiguous story with a Palestinian friend of mine. As some of you may know, basically all Arabic street names disappeared after the foundation of the State of Israel in 1948; some were replaced by numbers, others were renamed after famous Jews or Israelis. So officially naming a square, - or rather a roundabout -, and thereby paying tribute to a Palestinian public figure, most of whose family was expelled from Palestine, is quite a big deal. After all we are talking about the city of Tel Aviv - Yafo, supposedly a "mixed city", whose municipality however refuses to have its logo written both in Hebrew and in Arabic. The fact that some members of the Dajani family travelled on their foreign passports to Jaffa to attend the official ceremony led by Tel Aviv mayor Ron Huldai makes the whole story even more absurd. 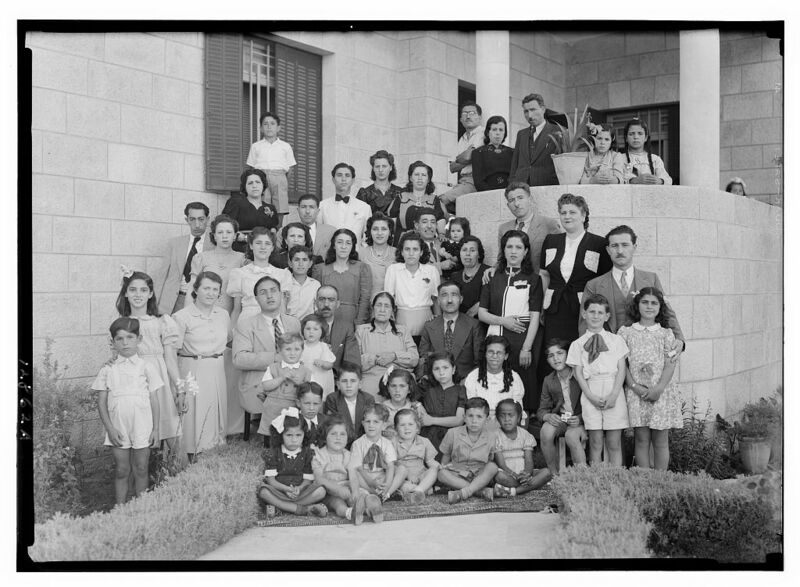 After all, the presence of those people, whose ancestor was being honoured in what was widely received as a benevolent gesture by the municipality, is only tolerated for a short time, obviously they are expected to leave to the numerous places they came from, those numerous places the Dajani family fled to after they were expelled from Jaffa in 1948. My friend and me therefore concluded that Dr Fouad Dajani was basically looked upon as a "good Arab", and naming a public space after him primarily served to show Israel's goodwill and its supposedly democratic character, rather than paying tribute to a noble Palestinian humanist. With this story in the back of my head, as well as with the question of how should I, a recent Jewish resident of Jaffa, an Israeli, an occupier, a coloniser, guide a person through a city that used to be his family's home for more than 900 years? Aref's answer to this question was basically "I know the stories, you show me the places." So off we went to what used to be Dr. Fouad Dajani's hospital which now serves as a residence for elderly people and which is a 5minutes walk from where I live. The street that crosses with my street carries now the name of a Jewish pendant to Dr. Dajani, a doctor and successful scientist, but as far as I know, up until 1948 it was named after Dr. Fouad Dajani as well. Already upon entering the complex, we were yelled at by the person guarding the entrance: "What are you looking for? You cannot just walk in here and stroll around as you please!" Although I immediately felt the anger inside of me boiling up, I did my best to remain calm and polite: "Excuse me, Sir, we just want to have a look at the building". "I told you you cannot just walk around here as you please!". The absurdity of the situation already drove tears into my eyes: "Could you listen to me for a second, please, the family of this gentleman here built this hospital and he came all the way from the United States to see it". I think he basically was just a grumpy character having a bad day and wanting to make sure that everyone else would take notice of it. Whether or not he understood what I had told him, he eventually allowed us to enter. The hospital, designed by a Jewish architect, and built by the Dajanis in 1933, is a beautifully modest modernist building located within a bigger complex of gardens full of benches and a fountain. 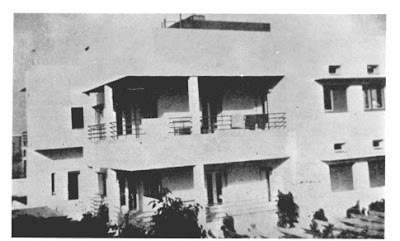 With time more buildings were added in order to meet the needs of the population that was served there. Aref asked whether we could look for a brochure or a pamphlet which would also feature images of the building as he saw himself incapable of capturing it in a photo himself. After our first encounter with the guard, I felt not so comfortable interacting with the personnel again, but I agreed to ask. We entered another building, which was probably something like a lounge for people with special needs who apparently also lived there. Immediately a number of people asked us how they could help us, this time however with a much more friendly attitude. A young Palestinian care taker immediately approached us and asked whether Aref belonged to the famous Dajani clan and after I explained our situation, an Israeli social worker offered to give us a short tour. First we were led to the grave of Dr. Dajani. The person behind the initiative to name the roundabout after Dr. Dajani had also managed to obtain permission for the family to place a tombstone on his grave. Dr. Dajani had died in 1940 at the age of 50 from an infection contracted from a patient during an operation. While standing at the grave, a person with special needs who had accompanied the social worker who guided us, kept on blowing kisses to Aref. The presence of a person who obviously did not distinguish between our different backgrounds, our laden identities, alleviated the otherwise so intense situation and Aref thankfully hugged her for her unbiased display of human sympathy. And yet, seeing the tears in his eyes, I could feel them welling up in my own eyes again and I patted his shoulder, probably to comfort him as much as myself. "That's it, I said my prayer", he said satisfied. We moved on to have a look at the old family home and the hospital itself. Throughout our whole tour, Aref was exceptionally kind to our guide, the Israeli social worker. He thanked her for looking after the place with so much respect and care and for taking her time to show us around. She asked him where he was living and after he explained that he himself was born and raised in the US, but that his family originally came from here, she asked what had happened to them, "did they flee?" Although she was very kind to us and seemed to be very open, I could again not hold back and said maybe too sharply "They were expelled!". After we had finished our visit, Aref thanked even the grumpy guard at the entrance, who only shook his head in anger once more, and we moved on to visit the square, or rather the roundabout named after Dr. Dajani. It is logical that the place would be closely located to the hospital, yet we both agreed that it was really in the middle of nowhere. In fact the roundabout is not even needed for traffic reasons, as there is hardly any traffic in that area at all. Upon closer inspection we also saw that on the plaque the word "hospital" was misspelled in Arabic. And yet, Aref concluded, it is a respectful gesture and does commemorate the life and deeds of the noble man that Dr. Fouad Dajani was. "How do you do that? How are you not angry?" I asked Aref. He explained to me that of course, he also felt anger, but above all he was pleased to be able to be present and that he had told himself he would come here in order to bear witness, a phrase he used repeatedly, like a mantra throughout our tour, "specifically for those members of my family who are not even allowed to see these places". I am happy that I was able to bear witness to Aref visiting the places of his father's stories and that I was reminded of the fact that being able to express my anger at what I hear and see is a direct result of my privilege of living at the junction of what used to be Dr. Fouad Dajani Street. "...But No One Speaks About Return”. A statement that can be right when you talk to Tel Avivians! Why would they return to Ukrane, Poland, Morocco, Yemen, US, S Africa, Hungary...to the end of the endless list of countries where these people came from! Their fathers or granfathers (at most) landed in Palestine. Thanks to the Dalet Plan, every village and city was systimatically detroyed with countless mass killing sprees (don not read Arab books please, Read Pappe's book on Ethnic Cleansing of palestine). 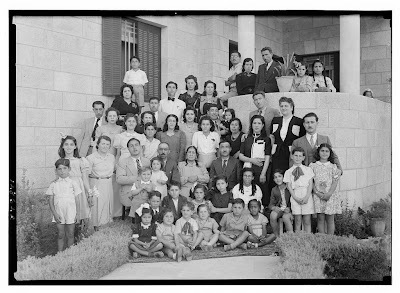 The other side of the coin: ask palestians who were born in Palestine before 1948 (they still exist, see www.beitdajan-yaffa.com), their kids, grandkids, and grand grand kids.. THEY WANT TO (and they will) return to the land where their grand grand grand (endless grands) fathers lived!